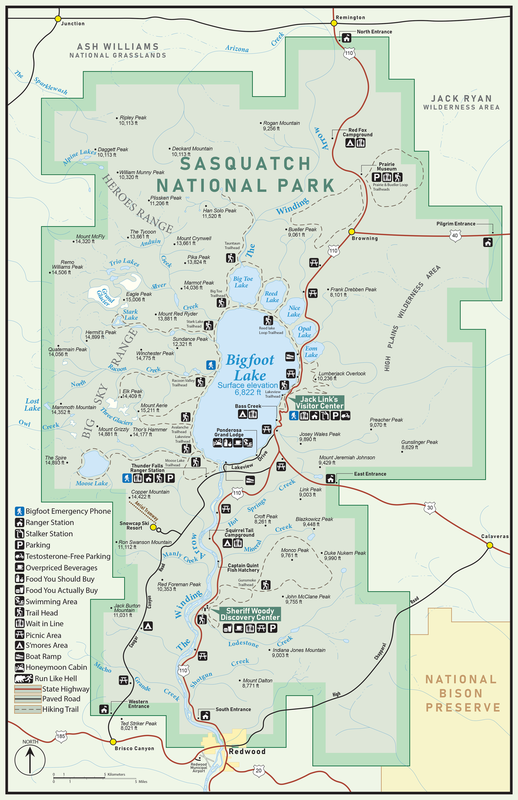 I went all in on V3.0 trying to replicate a national park style map and used a real map for Grand Teton National Park from: https://www.yellowstonepark.com/park/official-grand-teton-national-park-map-pdf as a guide to improving my fictional "Sasquatch National Park." Lots of references to westerns, action films, video games and classic 80s movies for many of the placenames. I went for humor on the pictograms, so they differ slightly from actual government produced maps! Constructive criticism always welcome; thanks! This cartographic work was created entirely in Adobe Illustrator.